Leander Stocks is suing the developers of Maryland Live! for $150,000 after being struck below the eye by a roulette ball at the caisno. Less than a week after we included Beach Life in the list of the online progressive jackpots to play, a lucky player from the U.K. turned a £10 spin into a life-changing £3.8m win. William Hill is no longer accepting players residing in Portugal and Estonia. n the past year, we have witnessed many casino-related crackdowns around the world, leading some to believe the industry is under attack. Update your password or close your account? Check out what to do to survive to June's LastPass hack and save your personal data! Slot machines are being removed in favor of table games and entertainment in Maryland. Free Spins (And Money) to Win BIG During The Weekend! 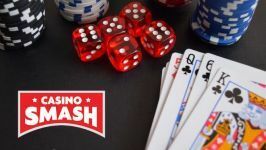 Discover how you can get free money and free spins during the weekend thanks to CasinoSmash. Are 3 New Casinos Coming to NJ? New Jersey legislators who previously were giving their support to allow two new casinos outside of troubled Atlantic City, have upped the ante and are now seeking for as many as three casinos in the northern part of the state. A Nevada Stateline casino janitor was arrested for theft last week after being witnessed literally sweeping away $10,000 in cash he found on the casino floor. The Gumball 3000 heads to Sin City on Friday with celebrations including a performance by Tony Hawk and entertainment provided by DJs Deadmau5 on Friday and Diplo and Skrillex as their collaboration JackU on Saturday. Matthew S. Nuegeboren, a Manalapan, New Jersey attorney, is in hot-water after admitting to stealing more than $2.6 million from an unidentified home health care company he worked for as in-house council. Connecticut Senate is reviewing a bill introduced a few months ago which would allow the state’s two federally recognized tribes to open a new joint casino. As casino gambling and poker do not seem to meet the demand of the younger generations, land-based casinos in Nevada have decided to look for new ways to keep their visitors entertained. Discover how you can get free money and free spins in this edition of Three Casino Promos to Watch.